Get ready to write at the level necessary to take your career forward. With a subscription to MY Access! Professional Edition, you can improve and enhance your ability to write clear, concise, and compelling communications for bosses, colleagues, and more! MY Access! Professional Edition is designed specifically to guide business school students through the process of learning to write purposefully, powerfully, and persuasively. Writing well can make the difference between a polite nod and an enthusiastic project approval. MY Access! Professional Edition lessons and writing activities offer MBA specific prompts to help you bring your written business communication up to the executive level. Subscriptions last for a full year from the date of activation and you can access your materials from any computer with Internet access. 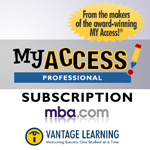 This product, created by Vantage Learning, is endorsed and supported by the Graduate Management Admission Council (GMAC), the owner of the GMAT exam and advocate for graduate business education around the world. As you reinforce your writing skills, you will focus on the process of writing itself: planning, organizing, drafting, revising, and editing. You will also learn to clearly form ideas, link them together in meaningful ways, and express them concisely, all while obeying the rules or conventions of writing. then, you write to succeed. Understanding the writing process quickly becomes a means to reaching higher academic and professional goals. As your writing improves, you will find it easier to organize, clarify, and communicate your message and inspire action. 36 writing topics that mimic real-world, work-related writing tasks. Self-paced, interactive lessons to guide you through the writing process: planning, organizing, drafting, revising, and editing. Immediate scoring and individualized feedback through a powerful, award-winning artificial intelligence scoring engine. Refund Policy Purchasers of this product are entitled to a full refund within 30 days of purchase by contacting our customer service team at 1-877-877-4085.